to efficiently get you around Raleigh, North Carolina. Complimentary with your next 2018 Camry is our Family Plan worth over $3,000! The more you drive in NC, the more you save with lifetime oil changes, lifetime powertrain warranty, lifetime car washes & even more. Click to learn more about our Family Plan. The all-new 2018 Camry will give you and your passengers peace of mind with upgraded safety features. Standard with every 2018 Camry is Toyota Safety Sense (™) P equipped with a pre-collision system, pedestrian detection, lane departure alert with steering assist, automatic high beams and dynamic radar cruise control. Plus, with 10 airbags, you will arrive at any destination safely. 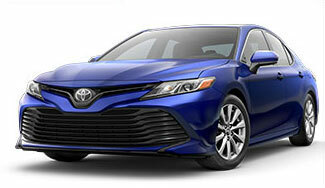 The all-new Camry is designed for comfort tailored to you with a driver-focused design. From the 8-inch multimedia touch-screen option to the Scout ® GPS Link app and 9-speaker, 800-watt Entune (™) 3.0 Premium Audio, you'll have everything you need at your fingertips. Plus, with over 56 inches of height and 72 inches of width, you and your passengers will be cruising the streets in spacious comfort. Get ready for superior technology in the all-new 2018 Camry which comes equipped with an integrated backup camera with projected path feature. Plus, get more with the Bird's Eye View Camera, Intelligent Clearance Sonar with rear cross-traffic braking and Wi-Fi connect options available with every trim.